The switching frequency is an important control parameter of P WM rectifier to reduce switching losses and E MI noise. This paper proposed a variable switching frequency P WM (VS F P WM) strategy for DC-link voltage ripple control in two-level rectifier. DC-link current directly determines the DC-link voltage ripple, and predicts synchronously with P WM signals. A real-time prediction model of DC-link voltage ripple is derived for a common voltage oriented control (V O C) P WM rectifier. introduced a VS F P WM control, which changes the switching frequency cycle to cycle with a restriction of DC-link voltage ripple peak value. Furthermore, also observes the dynamic behavior with the adoption of the proposed VS F P WM control scheme. Detail simulation and experimental comparisons between V S F P WM and normal constant switching frequency P WM (CS F P WM) demonstrate the advantages of the proposed method. The contribution of this paper is to develop the VS F P WM strategy for DC-link voltage ripple control. Different from the previous work on the AC-side current ripple or torque ripple, P WM current ripple of AC-side does not affects the DC-link voltage ripple. In a rectifier system, P WM method determines the DC-link voltage ripple and load current, and the peak value of it is important for DC-link capacitor design or selection. 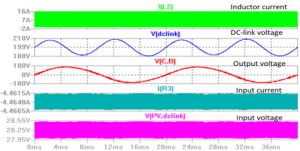 The proposed VS F P WM fully utilizes the freedom of switching frequency, which is often neglected in the P WM module. DC-link voltage ripple prediction model can be built in the time-based-domain. With the three-phase duty cycles, AC-side current and load current measured by the current sensors, the DC-link voltage ripple peak can be predicted for updating the switching frequency in next cycle. The prediction method also applies to other P WM methods, and also be used for design and analysis of DC capacitors and DC battery reliability. In a whole line period, the switching frequency of VS F P WM continuously varies below the designed constant switching frequency, keeping the DC-link voltage ripple always under the requirement. Using the proposed VS F P WM strategy, the switching losses decrease significantly, and E MI noise reduces markedly. Typical closed-loop control system investigates the dynamic property of VS F P WM. In fact, VS F P WM still has a good dynamic response, without nearly impairing the tracking performance shown in common CS F P WM. The open-loop Bode plot indicates the VS F P WM methods just decrease a little bit of bandwidth of both voltage control loop and the current in CS F P WM because of the reduction of average switching frequency. J. Rodriguez, J. Dixon, J. Espinoza, J. P on t t, and P. Le z an a, “P WM regenerative rectifiers: State of the art,” IEEE Trans. Ind. Electron., vol. 52, no. 1, pp. 5–22, Feb. 2005. B., Singh; B. N., Singh; K., Al-Had dad; A., Pan d e y; and D. P., K o t ha r i,“A Review of Three-Phase Improved Power Quality AC-DC Converters,” IEEE Trans. on Industrial Electronics, Vol.51, pp.641–660, June 2004. A. Mar z o u k i, M. Ham o u d a, and F. F n a i e ch, “Sensor less Nonlinear Control for a Three-Phase P WM AC-DC Converter,” in Industrial Electronics (IS IE), 2010 IEEE International Symposium, Bar i, Italy, pp. 1052-1057, July 2010. M.Malinowski, M. P. K a z mi er k o w ski, and A. M. Tr z y n a d lo w ski, “A comparative study of control techniques for P WM rectifiers in ac adjustable speed drives,” IEEE Transaction on Power Electronics,vol.18,no.6,pp.1390–1396, Nov. 2003.